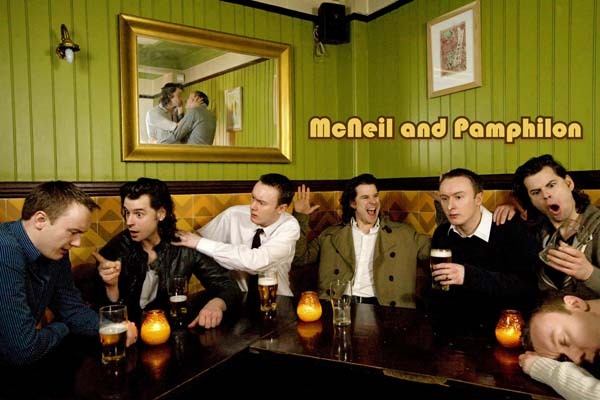 McNeil and Pamphilon's debut Edinburgh show played to sell-out audiences at the Pleasance Dome in 2010, and received critical acclaim for their "high standard of innovation and comic writing" (The List) and "outstanding comic abilities" (Broadway Baby). "This hugely enjoyable duo" (Three Weeks) currently host a residency at The Albany in London which has been recommended by both Spoonfed and London Is Funny, and chosen as Critic's Choice in Time Out. - and various 'normal' tv stuff like Holby City (BBC) and Stockwell (ITV). Steve replaced Rik Mayall at short notice to play the lead role of Skinner in The Peter Hall Company production of "Balmoral" and Sam played the male lead in the short comedy, "Can We Talk? ", which won an Honourable Mention Award at the Sundance Film Festival. They both performed in Phil Nichol's Comedians Theatre Company's "Itch: A Scratch Event" at the 2010 Edinburgh Fringe Festival.